So this picture came up as a tag in my feed last week. And I was embarrassed. I made this hat for my kids. It was ill-fitting, not a great use of the yarn, and poorly made. I decided to attempt to fix it by lining it. Nope. Made it worse. Oh well. Still wearable. So I put it on my kids and got a few warm heads and cute pics out of the deal. A couple of years later, I handed the hat off to a friend when she had a baby. And now it’s back. Her baby is wearing it and she tagged me in the picture (to be kind I’m sure). And I just wanted to open up a void in the floor and crawl inside. **SIDENOTE: It has to be acknowledged that her baby, Posey, is super cute. My daughter in the hat. This little picture reminded me of this post which I have been intending to write for some time. That desire to voip away is a major reason I don’t like giving away or selling makes to other people. It’s really personal! In fact, lots of makers hesitate or have horror stories of making for others. If you know many talented professional or amateur makers, you know many don’t enjoy creating for other people. I hear it all the time: “Sewing for other people is awful, just say no!” I listen to sewing podcasts and they ask “How do you tell other people ‘no’ when they want you to something for them?” These are the same people who want to be sustainable makers, and the very same people who are trying to make many garments a month to enhance their sewing skills. Ok guys. What gives? Why is it so hard to make stuff for other people? Why is it so much more satisfying to make stuff for ourselves? How can we sew multiple garments a month for one person and still pretend we are not contributing to fast fashion? ***DISCLAIMER! For many of us, myself included, crafting is one thing that we do just for ourselves. I’m not in any way saying you shouldn’t make nice things for yourself. But, if you’re a prolific maker (like I tend to be), I’m just sharing and debunking some of the excuses I commonly give myself. My work isn’t good enough for other people to wear. It’s so much work. People aren’t appreciative enough of my effort. I tell myself these all the time. But I’m gonna go ahead and raise the bologna flag to myself. **raises flag** Even if these are sometimes true, it doesn’t mean that all requests or gift ideas should be categorically removed as possibilities. Excuse #1: My work isn’t very good. Long ago, I made a friend a hat. Years later he told me it had a weird cone at the top instead of being a nice round beanie. He said it was “really awful”. And I was really embarrassed. I’m still really embarrassed when I think about it. But I didn’t give it to him because I wanted to give him a gift. He accepted it gratefully because he knew I put time and effort into making something just for him. Almost every knit item I gave to people in my first three years of knitting was legitimately awful. Very bad. And I had no idea. Do you know why I had no idea? Because I was seeing the makes in the honeymoon phase of my craft when everything was beautiful and most of the recipients pretended to love it at the time and only told me later about the faults. Did I mention this is embarrassing? Ok, good. But hey! At least I don’t personally have a pile of ill-formed hats and ugly mittens sitting around my house. If I did. I probably wouldn’t have kept knitting. Get rid of that stuff! If you realize it’s garbage at the time, frog it (that’s a knitting term for rip out the stitches and use the yarn again for something else or to fix the project) or cut it up and save the fabric for something else. If you are seeing it through rose-colored glasses, then hasta la vista baby! Someone got a present that you put effort and time into and thought was great but wasn’t actually perfect. Oh well! I say this lie to myself a lot! Alright, Self, knock it off with the negative self-talk. If your work is good enough for you, it’s good enough for your close friends and family. And if it’s not, then fix it. You made it. Figure out what went wrong and fix it. It will make you a better crafter. As you improve your skill, you will be able to see the mistakes of early work. But you can fix them! What Can Get you Past This Hurdle? Learn to fix your mistakes! Later, I made my him a Vogue pattern vest. I even bought new materials and a new pattern. It was painfully expensive. When I finally finished it, he tried it on, and it was too small around his bust (is that the right term on a man?). Did I despair? Only for a minute. I may have asked if he would like to remove a rib or two. Then I realized that when you use a 5/8” seam allowance, you can rip out that seam and re-sew with a 1/4 “ seam allowance. If you do this on either side of a garment, you can eek out an extra inch. If I hadn’t made the mistake, I wouldn’t have learned this. Also, I now take better measurements before starting a project. Excuse #2: I want it! The color was a beautiful spiced orange and I paired it with a lovely deep green. Instead of just knitting a lame little stem I knit a super long stem and some leaves to go with it. I placed the stem in swirls around the hat and tacked on the leaves artfully. I also made a little matching cardigan in green and orange. Can you tell that I liked this project? I did. I was super proud. But the set was a little big for my daughter, so I gifted it to her cousin for Christmas since I assumed I would get it back as a hand-me-down. Long story short: I did not get it back. Her mom gave it away and then tried to give me someone else’s much lamer version of the pumpkin hat when I asked for it. I was truly furious at the time. SIDENOTE: How do these other insta-parents get their kids to sit in little woolly sweaters and starched shirts? My kids won’t even wear socks! What Can Get You Past This Hurdle? Find a way to let go happily. The “I want it” reason is tricky. I mean. If you want your stuff, you certainly have a right to it. I’m not here to tell you to give all your makes away. However, sitting on a gigantic pile of beautiful makes is not going to make you happy in the long run. In fact, for every hat I have kept because I like the way it turned out, I have an idea for another hat I’d like to make. The problem is, I don’t need another hat. You are not a dragon, you do not need a stockpile of treasured makes. All those projects sitting in your closet can’t get the wear they deserve if you have too many. Also, like I said before, the presence of old projects can stop you from making new ones. Change the recipient: When I started getting decent at knitting, I decided to make an afghan for my boyfriend’s mom for Christmas. Once I picked out the yarn and got about halfway through the panels, I was really attached to that blanket. The idea of giving it away to someone I didn’t really know made me very sad. So I ended up giving the gift to my mother instead. Giving gifts to those closest to us is a nice cop-out because it means we still get to see the make more often. Guess how many times my kids wore these pant I made them! 0. They could not hate them more. SIDENOTE: There are much worse worst case scenarios than this. 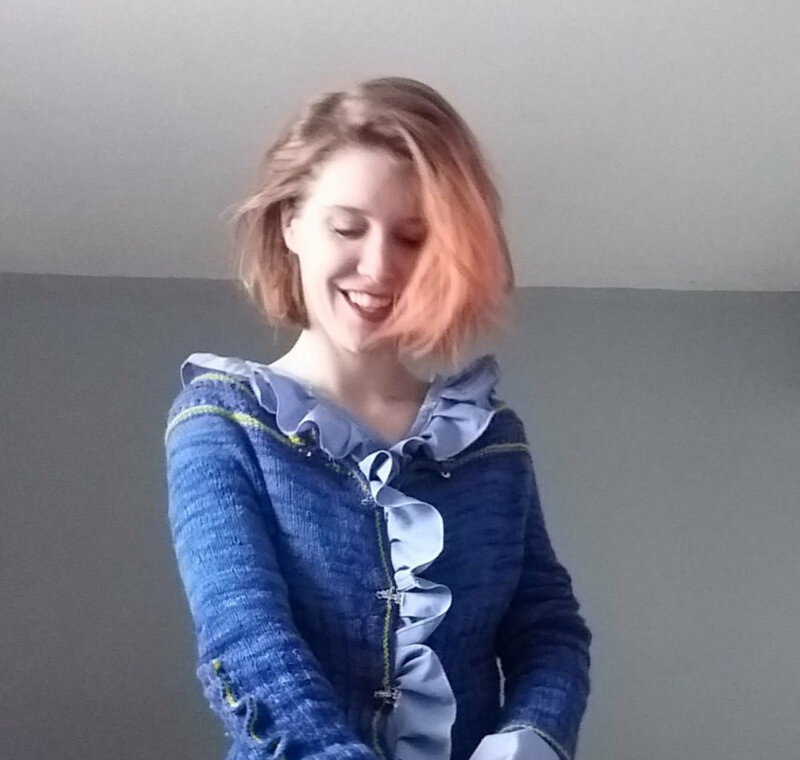 If you read blogs or listen to sewing gurus, they can tell you how bad people can be about custom-made clothing they purchase. I’m talking about making clothes for the people close to you, not as a profession. Also, try not to make things for jerks. What Can Get You Past This Hurdle? Change your perspective. Long ago, I made some mittens. They were my second pair. They were made from a white yarn plied with what I can only describe as silver tinsel. As if this weren’t ugly enough, I decided I wanted to learn to embroider (with yarn...yeesh), so I hand-embroidered my sister-in-law’s initials onto the back (in yellow...double yeesh) and gave them to her. Her disdain was immediately apparent, just as it has been for every gift I have ever given her. So let this be a reminder: If you can’t please someone, you might as well get better at things that please you. That’s not quite a happily-ever-after ending. But the moral of the story is that, it’s ok if people don’t always like your stuff! Sometimes they will. In general, I want people to like the things I make for them. Of course. But also, I don’t make things for people just so they like them. I make things for people because I love making things, and giving my time and sharing that love with people is the best thing I can usually think to give. I also make stuff to elevate my craft. (And sometimes I make stuff because I had the yarn lying around and I’m not going to waste money buying gifts my in-laws will hate when I can make gifts my in-laws will hate for free.) Constantly expanding my wardrobe or collection of mittens is not going to give me the same depths of knowledge as making things for different bodies and different uses. Also, it’s far less sustainable to only make for yourself. I know of people who aim to make a new garment every week, just to become better sewists. No one needs 52 new garments a year. Share the love people! If you keep practicing, your makes will be adored by the recipients. Live boldly! Give your makes to the people around you! On your journey as a maker, eventually you can get to the point where you have become adept at making clothes for your own body. And doing that for so long seems to calcify the skillset to only making clothes for your own body. There is no doubt that sewing for you and those in your household is easiest. However, sometimes it’s good to stretch your comfort zone. If you try sewing for a new body, you will be forced to handle problems you haven’t handled before. You will undoubtedly learn new skills and face new challenges. That can be difficult, but it will also elevate your craft. How Can You Get Past This Hurdle? Get over it. My work isn’t good enough. Did I try? Did I make it with good intentions? It truly is the thought that counts. And it made me a more talented crafter for future projects. I’d say that’s reason enough (although I won’t be charging money for it and I likely won’t be giving it to a professional maker). I want it. This one is tough, sometimes you have to treat yourself. But if I give beloved makes to someone close to me, I will probably be able to see it often. If I am really worried, I give the recipient the earnest, obsessed expression that we all possess as makers and say “If you don’t truly love this, I completely understand. I can take it and give it a loving home if you don’t feel you can. And I love it so much that I won’t be heartbroken if you don’t.” Usually, if I love something this much, they will too, especially after they see the worth I’ve given it. And if they don’t, hopefully they will give it back. And if not. I can make it again (probably even better than the first one). People aren’t appreciative enough. Yup. But how often do I focus on the mistakes in my projects? Quite a lot. Giving it to someone else means that item can live a happy life without the owner constantly wishing she had made a seam a bit straighter. If you really want to make people appreciate a project, describe the whole process of how you made it so they understand the work that went in. If people still don’t appreciate it, that’s ok, don’t give anything else to that person. Find a new person. Easier to fit myself. True. But I don’t make clothes because it’s easy. If easy was the gaol, I could go to the store. I need to put on my grownup underduds and get out the measuring tape. It’s so satisfying to make something fit myself just right. It’s equally satisfying to do that for someone else. So start making and start giving! Give freely! Give often! Give to people you know! I promise, it brings more pleasure than pain. I’d love to know if you have some big failure projects that were gifts for other people. Did you fix them? Did you hope they wouldn’t notice? Did you punch some un-appreiciative jerkwad in the face?